Beach lovers and city dwellers can both find a home in Sarasota. “There are so many lifestyle options in Sarasota,” said Drayton Saunders, president of Michael Saunders & Company, a local real estate firm founded in Sarasota in 1976. The Florida city gives residents the option between bustling urban life, laid-back island life or a combination of the two. 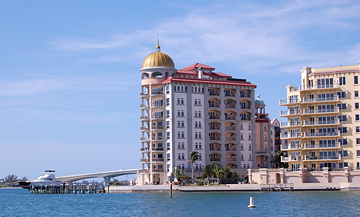 That could mean high-rise living on Sarasota Bay, within walking distance of the downtown shopping and dining. Or, perhaps, it’s a home on the Gulf, where beach lovers can enjoy watching the waves and then wandering over to a restaurant on the sand. Whatever lifestyle locals choose, they all have access to the city’s many cultural offerings. Once the winter home of John and Mable Ringling of the famed Ringling Brothers Circus, Sarasota boasts acclaimed dance and music performance groups, plus notable art museums and galleries. Athletes and sports enthusiasts have plenty to keep them busy, too, such as world-class rowing facilities, award-winning golf courses and the Major League Baseball teams that train in and around Sarasota in the spring. The Sarasota area first started to get attention when businesswoman Bertha Palmer began buying property in the 1910s. Palmer was well-known in high society and was one of the first notable people to winter in Florida. She bought tens of thousands of acres and developed residential projects like Palmer Ranch. She encouraged other wealthy Americans to come to the area, and many of the city’s thoroughfares still bear her name. Now, in the coming years, Sarasota will be developing a whole green space on the water. Last fall, the city approved a master plan for The Bay, a 42-acre project that will redevelop a largely concrete area into a lush green space. The plan calls for a waterfront promenade, botanical gardens, and a new performing arts center, Mr. Saunders said. “The Bay will convert a place that people never go to—a parking lot—into a public stage that doesn’t have any cost and everyone can enjoy,” he said. Several neighborhoods in Sarasota offer residents walkability to downtown, where they can hit the shops or galleries—or the farmer’s market on the weekends. Nothing’s too far away, so boating or golf outings are regular activities. During evenings, residents can enjoy dinner and a concert and, in the spring, they can scope out the Major League Baseball teams in training. And, the city “has the good fortune of having a really cool history,” Mr. Saunders said. After Palmer’s first foray into the area, John and Mable Ringling came on to the Sarasota scene in the ’20s. They were art lovers, and that legacy lives on, with arts and culture at the heart of life in Sarasota. There are also several playhouses, Ms. Furst said, plus elegant restaurants and cool coffee shops that help create a robust, sophisticated nightlife downtown. And there’s the Ringling, which is really four museums in one: the Museum of Art at the Ringling, which opened to the public in 1931; the Circus Museum; the Historic Asolo Theater; and the Ca’ d’Zan, the Venetian Gothic former home of the Ringlings. Ms. Furst describes the city as a “haven” for artists and art lovers. She noted Palm Avenue downtown, which is lined with art studios showcasing everything from ceramics to paintings to eclectic jewelry. Or there’s Southside Village, which is part of the West of Trail area, she noted. There you’ll find outdoor restaurants and pubs, plus small boutiques, salons and spas. 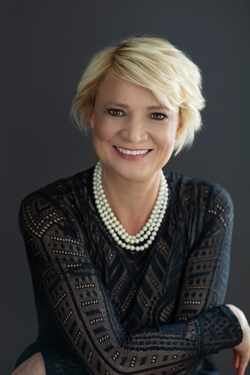 The whole area around Sarasota is awash with golf courses by the likes of Jack Nicklaus and other well-known designers, Ms. Furst explained. Spring brings three baseball teams to the area for their pre-season training. The Baltimore Orioles have a facility right in Sarasota, and the Atlanta Braves have just built a new compound south of the city. Many Sarasota residents are “raving fans of the Tampa Bay Rays,” Ms. Furst said. As for housing, “there’s everything from townhouses to high-rises downtown,” according to Ms. Furst. That might mean high-rise condos on the bay with water views, manicured grounds and all the amenities of a five-star hotel. More and more luxury projects have been developed in the last decade, Ms. Furst said, allowing residents to enjoy that lifestyle within minutes of both the beach and the city center. “West of Trail”—which takes its name from its location west of U.S. 41, a.k.a. the Tamiami Trail—is another coveted area. Ms. Furst explained that it has seen a revival in the last 15 years. “Many of those homes came with the era of John Ringling,” she said. “They have been restored and enhanced to keep that kind of vibe.” New houses are in the mix there, too, she added, with some elegant, spacious builds on the bayfront that are within walking distance of downtown. There’s also the Rosemary District, where buyers are either renovating old bungalows or building modern homes in their place. “That’s within blocks of our downtown as well,” Ms. Furst said. Just a few miles away, Sarasota’s barrier islands offer a lifestyle all their own. Beach lovers can find modern homes right on the water, where they can enjoy the waves all day and casual eateries in the evening. Siesta Key is a top-ranked beach, with glowing reviews from casual and professional beach bums alike. The publicly accessible beach gets high marks by users, and has twice been dubbed the best beach in America by Dr. Beach, the “guru” of the world’s best beaches, according to Ms. Furst. “There’s no sand like Siesta Key sand. It’s literally like walking on powdered sugar,” Ms. Furst beamed. It’s a laid-back, beach-lovers’ paradise, and it’s recently become full of little restaurants that welcome diners in bathing suits and flip flops. And it’s only about a five-minute drive from downtown Sarasota, she added. Siesta Key is home to the Sanderling Club, Mr. Saunders said. It was first designed by Paul Rudolph, who would later head the Yale School of Architecture. The gated community boasts a beach club with tennis courts, beach cabanas and a children’s playground, all with views of the Gulf. There’s also boat dockage on the bay side of the island. Lido Key also has beautiful beaches and great sand. 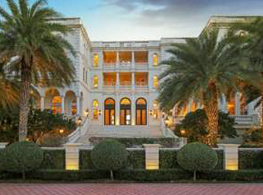 St. Armand’s Circle on Lido Key was founded by Ringling as a place for his guests to shop. Now, “it’s sort of like a mini Rodeo Drive,” Ms. Furst said. The Lido Pavilion has been restored, providing access to the beach, she added, and there is a crop of high-rises there overlooking the water. Longboat Key is in the other direction, she added, and is the home of the Longboat Key Club, which has a beautiful golf course and boating amenities. It also has a new tennis facility. In the keys, buyers can find expansive estates that are right on the water there, and throughout the region, runs the gamut from Coastal Contemporary to Mediterranean styles, Mr. Saunders said. In addition, the Sarasota School of Architecture brought a “modernist flair” to southwest Florida starting in the 1940s, he explained. “They really put their imprint on modernist-style, Florida-specific architecture, and that has carried through and influenced second- and third-generations of architects,” Mr. Saunders said. For those looking for more of a suburban lifestyle, master-planned communities also make up a large part of the city’s housing options. These offer a mix of privacy and social centers, such as parks, restaurants and shops. Others have a golf course at the heart of the development, with tennis courts and walking trails nearby. 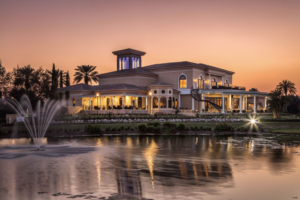 Lakewood Ranch is one of those communities, the third-largest in the country, according to Pam Ali, the manager of Michael Saunders’s office there. It is inland from the bay, between Bradenton and Sarasota. It first broke ground 25 years ago, she added, and it’s only grown since then. Walkability has been built into the plan, from the Main Street to the miles and miles of walking trails throughout the community, Ms. Ali said. There are also plenty of parks, and it’s about a 30-minute drive to the beach. The community is home to Nathan Benderson Park, which has state-of-the-art rowing facilities. It welcomed the World Rowing Championships last year and hopes to host the 2020 Olympic rowing trials. Locals can also use the park to jog, canoe or kayak, Ms. Ali said. Last year, developers broke ground on a new outdoor section called Waterside, built around seven lakes, and with 20 miles of shoreline. The new village is the first located within Sarasota, and will also feature a nature preserve and outdoor concerts on the water. It is also the future home of the Manatee Players, a theater troupe. With all Sarasota has to offer, community is still at the heart of the city. For starters, the warm weather keeps people outside, active and engaging with others. Sarasota, like much of Florida, attracts second- or third-homebuyers in their 50s and above, Ms. Furst said. But more and more young families are also coming to southwest Florida, lured by the weather, amenities and school systems. And the city is committed to developing new amenities for all its citizens. The master plan for the Bay project was unanimously approved by the city commission in September, and the team behind it is working to start the first phase as soon as possible, Mr. Saunders said. The project will have a new performing arts space, a market and recreational activities like yoga classes and a trapeze school, as well as green spaces and walking trails throughout. Boat ramps at the existing site will be relocated, and there will a bait-and-tackle shop. There are several high-rise condominiums already underway around the planned public space, Mr. Saunders said, including the Ritz-Carlton Residences. The Bay “will drive values up for private landowners all around it,” he added. Sarasota residents were overwhelmingly supportive of the project, Mr. Saunders said.